a strong work ethic and self-confidence. Located in north Waterloo, the main DEPTH facility is located near the Conestoga Mall close to the intersection of King & Northfield. 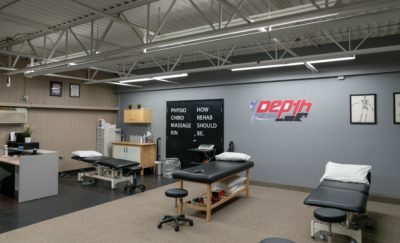 Located above The Zone Training, DEPTH features a fully equipped fitness facility including turf field, weight room, studio, and physiotherapy clinic. Located in just outside Cambridge, ON at Whistle Bear Golf Club, select DEPTH trainers offer services at this location. Whistle Bear offers a unique ambience. The tranquil energy from the natural surroundings is something not easily found in other fitness environments. What Does Depth Whistle Bear Offer? 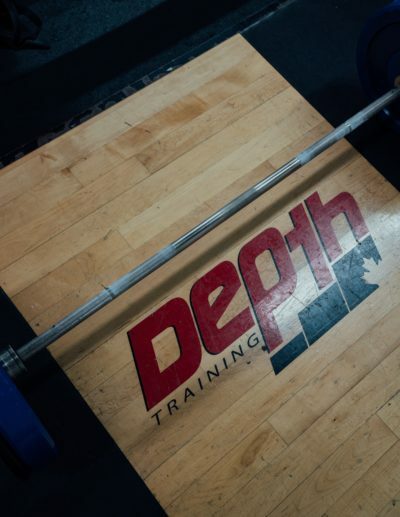 Located in Kitchener, ON at Sportsworld Arena, DEPTH is the Strength & Conditioning provider for Victus Academy. Established in 2016, Victus Academy is a hockey specific private school for Grade 7-12. Together with a group of hockey experts, we help develop young hockey players both as athletes and people. Dave graduated from Wilfrid Laurier University with a Masters of Business Administration, from Queen’s University with a Bachelor of Education, and from the University of Waterloo with a Bachelor of Science in Kinesiology. He takes pride in developing clients’ mental capacity, and he encourages self-confidence to overcome any obstacle and achieve personal excellence. Dave has a wide variety of practical experience relating to fitness, on-ice skill development, and athletic development. He also has an optimistic outlook on life and promotes a challenging, educational, and fun atmosphere for all clients. Away from DEPTH, Dave not only enjoys running, playing recreational sports, and spending time with family and friends, but he also enjoys experimenting with different training methods and reading about coaching, training, and business. Justin graduated from Queen’s University with a Masters of Physical Therapy and from the University of Waterloo with a Bachelor of Science in Kinesiology. Justin has obtained a variety of certifications since graduation, including AFCI Acupuncture, Active Release Technique (ART) Lower Extremity, and OHA Development 1 Coaching. He is also certified as a Strength and Conditioning Specialist (NSCA) and Precision Nutrition Coach. Justin brings both practical knowledge and a scientific approach to the DEPTH Training team to ensure his athletes and clients are well trained, both physically and mentally. Justin emphasizes dynamic movement techniques with the proper execution of strength and power exercises, to develop efficient athletes capable of high level performance while minimizing injury risk. Away from DEPTH, Justin enjoys reading about training, rehab, and nutrition, spending quality time with the important people in his life, and finding ways to challenge his boundaries and stimulate personal growth. Mike graduated from Queen’s University with a Masters of Physical Therapy and from the University of Western Ontario with a Bachelors of Science in Kinesiology. Mike has completed several courses since graduation, including Concussion Management, Active Release Technique, and Contemporary Medical Acupuncture Certification from McMaster University. His approach to treatment incorporates the use of Manual Therapy, specialized exercise, Active Release Techniques (ART), and Contemporary Medical Acupuncture, and he is currently working towards a Diploma of Advanced Manual Therapy. Mike has worked extensively with amateur and elite athletes, including NHL, AHL, OHL, and other professional leagues. 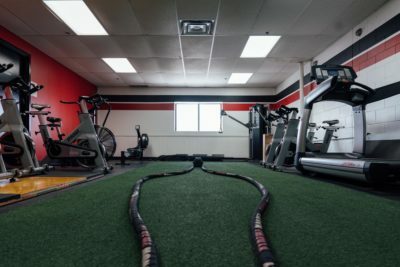 With an understanding of the functional demands of hockey and training, Mike uses his physiotherapy approach to restore adaptive potential, reduce the risk of injury, and maximize athletic performance. Away from DEPTH, Mike enjoys travelling, reading about personal finance, and spending quality time with his wife and Labrador retriever. Samantha graduated from Wilfrid Laurier University with a Bachelor of Communication Studies. She started coming to DEPTH as a part of a server challenge and fell in love with the atmosphere. Sam started to find enjoyment in physical activity and pushed herself to her limits! She enjoys the group dynamic of class based workouts to have other people cheer you on, and build friendships along the way. When Sam is away from DEPTH you can find her with her dogs, going on hikes, playing volleyball and spending time catching up with her family. 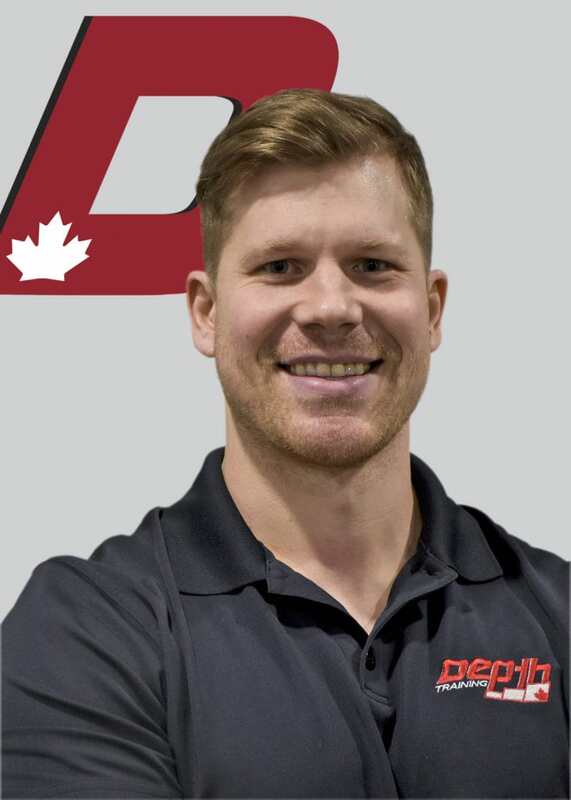 Neil graduated from the University of Waterloo with a Bachelor of Science in Kinesiology and has completed his High School Strength and Conditioning Specialist Certification with the International Youth Conditioning Association. Neil incorporates a high-energy coaching style into his training sessions to help his athletes push their boundaries and achieve their goals. 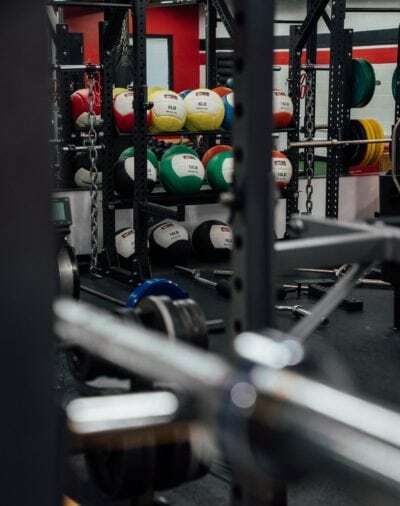 In his own personal workouts, Neil incorporates many of the foundational training methods implemented by DEPTH athletes while experimenting with drills that help to improve athletic performance. Away from DEPTH, Neil is a former CIS soccer player for the University of Waterloo and still enjoys playing soccer and attending TFC games. Dean graduated from Brock University with a Bachelor of Physical Education. He strives to make fitness something that is sustainable for everyone. Even though training sessions last for a limited period of time, Dean ensures that the training is purposeful and the learning in each session lasts a lifetime. Regardless of whether it’s a rehab session, fitness class, or athlete training session, he makes sure that his client always knows exactly what they are doing, why they are doing it, and what the outcome will be. Dean finds it most rewarding to see a client reach their personal goals, learn something new, or simply perform a movement pain free. Away from DEPTH, Dean enjoys reading, travelling, and listening to music. Andrew graduated from McMaster University with a Masters of Physical Therapy and from the University of Western Ontario with a Bachelor of Arts in Kinesiology. Andrew has also completed Junior and Senior Sports Physiotherapy Fellowships with the Fowler-Kennedy Sport Medicine Clinic and a variety of courses since graduation, including Manual Therapy, Sport Rehabilitation, and Concussion Rehabilitation. He has had the opportunity to work with various sport organizations, including Hockey Canada, AHL’s Hamilton Bulldogs, and OHL’s London Knights to name a few. Andrew incorporates a functional and biomechanical approach to assessments and uses diverse treatment methodologies to appropriately target the presenting condition. Andrew is currently the therapist for the Waterloo Siskins Jr B team. Away from DEPTH, Andrew is a former CIS rugby player and continuously strives for personal fitness through sport, physical training, and CrossFit challenges. He also enjoys reading, travelling, and wine tastings. Attila graduated from Queen’s University with a Masters of Physical Therapy and from the University of Waterloo with a Bachelor of Science in Kinesiology minoring in Human Nutrition. Attila is currently working towards his Diploma of Advanced Manual Therapy and is devoted to lifelong learning. Since graduating, he has also completed his Contemporary Medical Acupuncture Certification from McMaster University. He strives to provide an evidence-informed approach to rehabilitation and performance. Attila’s treatment philosophy is strongly grounded in knowledge transfer, therapeutic exercise, manual therapy and optimization of movement. He is a strong believer in treating the person and the cause instead of centralizing on just the injury. This is evident in his comprehensive assessments and treatments as they focus on the individual athlete’s goals, lifestyle and capacity. Away from DEPTH, Attila is a competitive individual who is consistently challenging himself physically and mentally. He enjoys reading about rehabilitation and real estate investing, playing sports, and is an avid outdoorsman. Kerri graduated from the University of Guelph-Humber with a degree in Kinesiology and diploma in Fitness and Health Promotion. Kerri continued her education at the University of Ottawa for a Master’s of Human Kinetics with a focus on Intervention and Consultation. She believes in a balanced approach to life that includes workouts, eating right and having fun. Kerri finds it’s important to work on the physical, nutritional and mental aspects with each client. She enjoys high intensity workouts for both strength and endurance, especially the workouts that include prowlers, kettlebells and battling ropes. In her free time, Kerri enjoys travelling around the world, cooking and trying new sports. She currently plays hockey in the winter and golfs in the summer. Dr. Jeff Smeaton is a graduate of Wilfred Laurier University where he obtained an Honours Bachelor of Arts degree in Kinesiology. He then completed the four year Doctor of Chiropractic Degree at Canadian Memorial Chiropractic College in Toronto. After graduating, he has gained additional certifications in Graston Technique, Active Release Technique, Medical Acupuncture and is certified in other functional assessment techniques. He is a Golf Medical Professional (Titleist Performance Institute) and Certified Strength and Conditioning Specialist (CSCS). Dr. Jeff has worked with many golfers from tour professionals to players looking to simply golf more without pain. He also has experience working with OHL, NCAA hockey players, and NCAA baseball players among many other athletes. 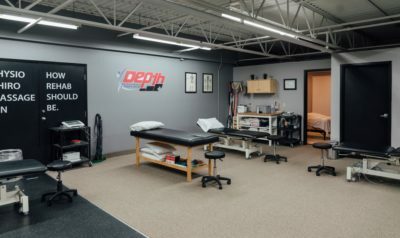 Dr. Jeff will help you become and stay injury free by creating an individualized treatment plan and ongoing communication as your needs evolve. Through treatment and education, he will empower you to proactively move better and perform better in whatever your daily tasks are and he will help get you back to living your best life injury free. Dr. Jeff has been involved in many sports throughout his life. He played football at Laurier for 5 years and finished his CIS career with the 2005 Vanier Cup Championship. He now enjoys keeping active golfing and spending time with his wife and two daughters. Gabbie graduated from the University of Western Ontario with a Bachelor of Health Sciences. Gabbie believes her role as a personal trainer is to give people the tools they need to succeed in reaching their personal goals. In her own personal workouts, Gabbie enjoys picking up heavy things and then putting them back down, while incorporating a good sweat session every now and again for good measure. Away from DEPTH, Gabbie enjoys watching Netflix and hanging out with her dog. Tessa graduated from Conestoga College as a Fitness and Health Practitioner. Her favourite classes to teach are strength classes because she enjoys helping others grow stronger and more confident in their abilities. Even Tessa’s own workouts are strength based as she loves increasing her strength and trying to beat her own records. Away from DEPTH, Tessa enjoys playing hockey and soccer, hiking, and hanging out with her dog. Stephanie graduated from the Ontario College of Health and Technology with a Diploma in Massage Therapy. In addition, she also graduated from Sheridan College with her Bachelors in Applied Health Science (Athletic Therapy). Stephanie has been actively involved in community sports as the Head Athletic Therapist for Wilfrid Laurier University Football, KW Titans, and Tri-City Outlaws. She continues to take courses to improve her treatment skills. To date, she has taken courses related to Concussion Management and Vertigo. Her philosophy is to help every individual overcome their injury to allow them to return to an active lifestyle as soon as possible. Away from DEPTH, Stephanie enjoys spending time with her Old English Sheepdog Seamus, playing board games, reading a good book, and quality time with friends. Lana graduated from Wilfrid Laurier University with a Bachelor of Science in Kinesiology and Physical Education (Minor in Biology). She loves athletic style workouts that centre around power, speed, agility, and strength. Lana most enjoys seeing our clients fall in love with fitness, work up a good sweat, and most importantly, have fun. Away from DEPTH, Lana is completing her Masters of Kinesiology with a research focus on perception and action integration in recently concussed athletes. She also plays soccer in the Ontario Provincial Women’s League and enjoys spending time with her family and friends. Kevin graduated from University of Western Ontario with an honours Bachelor of Science degree in Physiology and continued on to the Canadian Memorial Chiropractic College to obtain his Doctorate in Chiropractic in 2007. Kevin has completed several courses since graduation including, Active Release Techniques (ART), Contemporary Medial Acupuncture from McMaster University and Titleist Performance Institute certified golf fitness instructor. His approach to treatment incorporates manual therapy (including spinal manipulation), ART, medical acupuncture and rehabilitation exercises. Kevin has worked extensively with amateur and elite athletes, including NHL, AHL, OHL and other professionals. Kevin aims his treatment goals at restoring proper biomechanics for sport as well as optimizing mobility and functioning for the athlete to ensure peak performance. Away from DEPTH, Kevin enjoys the busy lifestyle of activity and sport with his wife and 3 kids, playing hockey and golfing whenever he gets the chance. Ben graduated from Wilfrid Laurier University with a Bachelor of Science in Kinesiology. Ben has developed a deep appreciation and passion for fitness that began many years ago when he first became a member of DEPTH Training as a 10-year-old athlete. 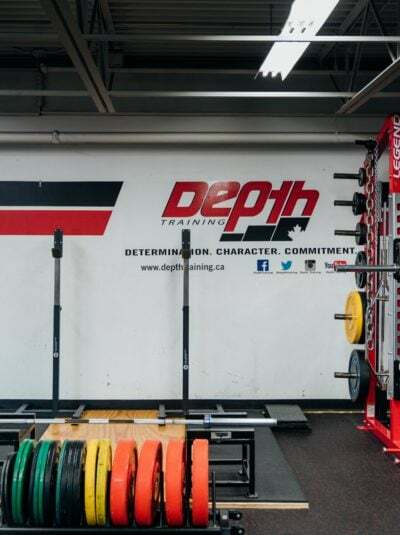 Regardless of whether Ben was attending a conditioning workout as a student of Wilfrid Laurier, or running a training session as a coach, being a part of DEPTH has taught Ben the value of performance training and fitness, both inside and outside of the gym. Ben believes in resiliency, in being understanding without ever accepting failure, and pushing yourself to limits you never thought you could reach. Away from DEPTH, Ben plays for Wilfrid Laurier’s varsity rugby team and for Waterloo County’s Rugby Football Club. He also enjoys visiting St. Jacobs Farmers Market, cooking, and lounging outside in the sun with his dog Harvey. Kathleen graduated from Queen’s University with a Masters in Physical Therapy and previously with a Bachelors of Physical and Health Education and a Bachelors of Life Science. Kathleen further obtained her advanced diploma in Manual and Manipulative Therapy, becoming a Fellow of the Canadian Academy of Manipulative Physiotherapists (FCAMPT), an internationally recognized qualification in hands-on therapy. In addition to orthopedics, she is a trained Pelvic Health Physiotherapist, focusing on the assessment and treatment of pelvic floor disorders, and holds a certification as a pre/post natal fitness specialist. Kathleen has also completed several courses in running injuries, concussion management, women’s health issues, breathing training and education, myofascial release, sport specific rehabilitation and acupuncture. Having worked with a variety of athletes and non-athletes, including marathon runners, triathletes, and ultra-marathon runners, Kathleen enjoys helping her patients attain their goals. Whether it be competing at a high level of sport, returning to exercise after childbirth or being able to complete daily activities without pain, her goal is to treat and educate her patients in evidence based practice and to give them the knowledge and skills to be successful in their rehabilitation journey. Kathleen has a special interest in women’s health issues, specifically post-partum care, running related injuries, and ACL rehabilitation. Away from Depth, Kathleen is an active mom to two boys, an avid runner, and overall health enthusiast. Lacey graduated from Wilfrid Laurier University with a Bachelor of Communication Studies. After graduating, she became certified as a Nutrition Coach with Precision Nutrition. Fitness is her “sport”. Lacey enjoys weight training, bootcamps, running, hiking, and obstacle course races. Away from Depth, she enjoys making memories with family & friends, drinking coffee while reading a good book, rock concerts, film, hiking trails, traveling to beautiful places, attending community events & interesting seminars, classic cars, and gourmet cooking. *Centering fix. Do not delete or put anything inside this column. WANT TO JOIN THE DEPTH TEAM? We’re always looking to add all-stars to our team! 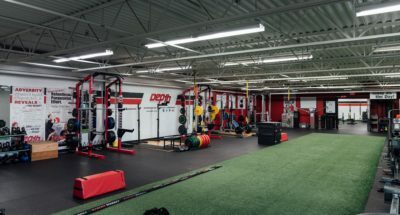 Send us an email at info@depthtraining.ca. Ready For a Cutting Edge Experience? Our innovative facility and specialized staff is here to help you achieve your personal goals.